Wow! Our lab just returned from the 2017 Society for Neuroscience meeting. It was the typical maelstrom of neuroscience–with more than 20,000 neuroscientists bustling about trying to share the latest and greatest about their research. 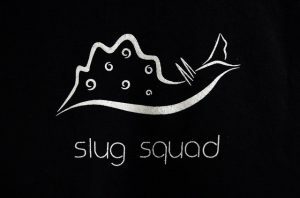 This turned out to be an especially great year for the Slug Lab. 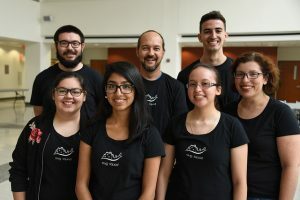 Leticia Perez, who has been working in our lab for the past two summers, submitted an abstract to present the work she and others in the lab have been doing on forgetting. We’ve been really excited about the results of this project. 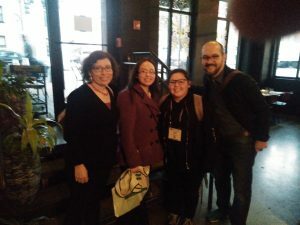 It turns out the SFN organizers were excited, too–they selected Leticia’s abstract for a 10 minute talk during a mini-symposium on the mechanisms of learning and memory. Leticia absolutely crushed it–she gave a concise, clear, and exciting presentation on what happens in the Aplysia nervous system as a long-term memory is forgotten. She handled the questions wonderfully, and was soundly congratulated by many researchers in the learning and memory community. 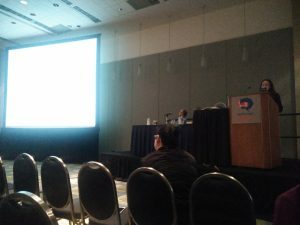 Of the 20,000+ in attendance, I’m willing to be she was the only undergraduate to give a talk at this year’s meeting. It was *such* an accomplishment. In case that wasn’t enough, Leticia also brought along a poster presenting the research. 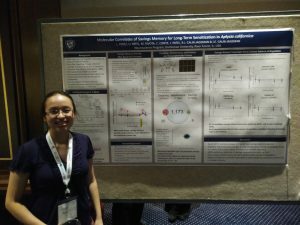 She gave the poster at the pre-meeting on molecular and cellular neuroscience and at the undergraduate poster session. Yes, that means she gave 3 presentations last weekend! Wow! And, again, all went wonderfully. Part of the reason Leticia was able to attend the meeting to earn all this acclaim is that she was awarded an Excel scholarship through Dominican University–this paid her registration, hotel, and airfare to make it affordable to attend the meeting. She still had to work like crazy to collect the data, refine the presentation, and clear her class schedule to attend. Lab alumnnus Marissa Rivota also attended–so her and Leticia also got to see the capital and the White house. 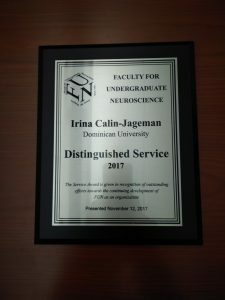 We’re so proud of Leticia, and of the many other students who have worked so hard in the lab for the past summers to make this forgetting project such a success. There will be a paper on it coming out very soon in Learning and Memory. It’s tremendous work to do good science–we’re so happy to have wonderful students who want to get involved and excel. Below are photos of Leticia giving her talk, giving her poster, and celebrating with me, Irina, and Marissa. Congrats, Leticia! The New Statistics for Neuroscience Education. This summer I (Bob) was asked to write a series of perspective pieces on statistical issues for the Journal of Undergraduate Neuroscience. My first effort has just been published–it is a call for neuroscience education to shift away from p values, and an explanation of the basic principles of the New Statistics with an example drawn from neuroscience. It turns out that the paper was published just before the annual meeting of the Society for Neuroscience, which I am currently attending. It’s been very gratifying to see the paper is already sparking some discussion. 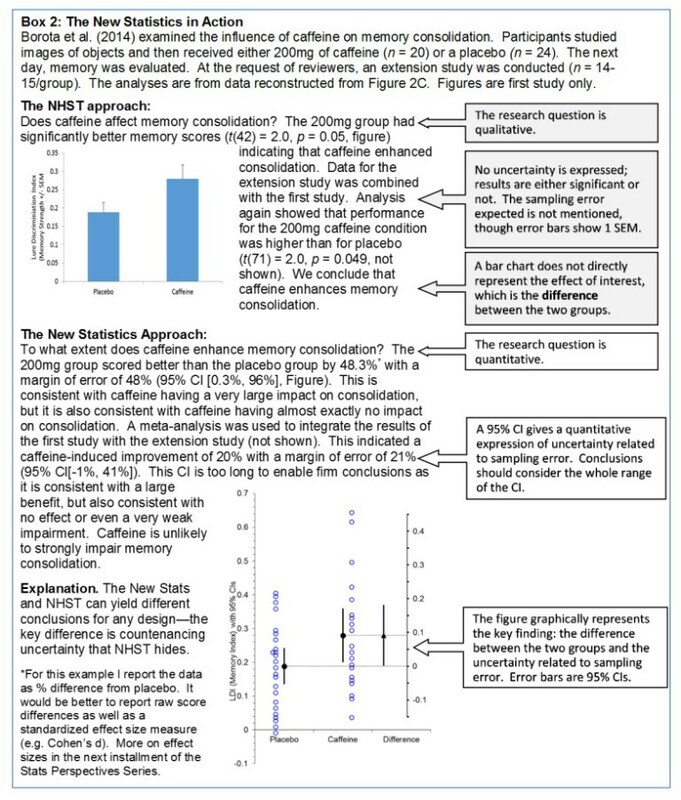 Here’s the key figure from the paper comparing/contrasting the NHST approach with the New Statistics approach with data from a paper in Nature Neuroscience. This fall I (Bob) was invited to give a talk at Indiana University as part of a series on good science and statistical practice organized by the university’s Social Science Research Commons (which is like a core facility for getting advice on statistics and experimental design…what a cool thing for a university to have!). I (Bob) have a new replication paper out today, a collaboration with DU student Elle Lehmann (Lehmann & Calin-Jageman, 2017). The OSF page for the paper with all the materials and data is here: https://osf.io/j3fyq/ (Calin-Jageman & Lehmann, 2015). 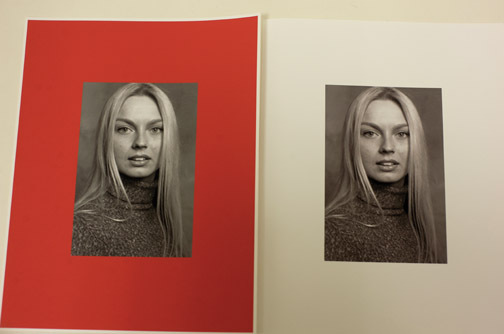 The paper replicates a set of previous findings showing that the color red dramatically increases romantic attraction for both women rating men (A. J. Elliot et al., 2010) and men rating women (A. Elliot & Niesta, 2008). Elle and I conducted two replications: one in-person with a standard psychology participant pool, the other online with MTurk participants. In each case we planned for an informative sample, used original materials, pre-registered our design and analysis plan, and used extensive exclusion criteria to ensure suitable participants (e.g. testing for color-blindness). In both cases, we are sad to report that there was little-to-no effect of red on perceived attractiveness or desired sexual behavior. There were a few weaknesses: 1) for the in-person study we didn’t obtain nearly enough men to make a good test of the hypothesis, 2) for the online study we couldn’t control the exact parameters for the color red. Still, we found no strong evidence that incidental red influences perceived attractiveness. Our replication work drew the attention of science journalist Dalmeet Singh who wrote a cool article summarizing the field and our contribution for Slate. Dalmeet has made covering negative results a part of his beat–how great is that! There have been some questions about these studies almost from the start. Greg Francis highlighted the fact that the original study of women rating men by Elliot & Niesta (2008) is just too good to be true–every study was statistically significant despite very low power, something that ought not to regularly happen (Francis, 2013). To help make sense of the data, Elle and I embarked on conducting a meta-analysis. It has turned out to be a very big project. We hope we’re nearly ready for submission. Andrew Elliot, the original investigator, was extremely helpful in assisting with this replication. Then, as the meta-analysis progressed, he became even more involved and has now joined the project as a co-author. The project’s still not complete yet, but I’ve really enjoyed working with him, and I’m proud that this will (hopefully) become an example of how collegial and productive replication work can be towards better and more cumulative science. 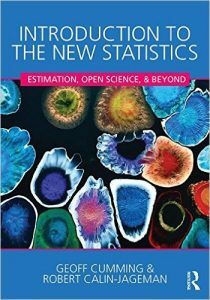 How can a statistics textbook change the world? By teaching the estimation approach to data analysis–one that emphasizes confidence intervals, replication, and meta-analysis. The estimation approach is vast improvement over Null Hypothesis Significance Testing. Students find estimation easier to learn and it supports better inference. Hopefully, this book will be an important step in the ongoing battle to abolish p values. Switching to estimation is not enough, though. Students of research also need to learn the new Open Science practices that are evolving to enhance research rigor: pre-registration, Open Data, and Open Materials. So the textbook is also the first to teach these essential practices from the start. The book is now available for pre-order on Amazon. It should be published by August, 2016–which is running just a bit late for fall adoptions. If you’d like a desk copy, shoot me an email or leave a comment. My student Eileen Moery and I have a new paper out today in Social Psychology and Personality Science. It’s a replication paper that I’m quite proud of (10.1177/1948550616639649). It represents some evolution in how I’m supervising replication projects. The new paper replicates a study purporting to show that being exposed to images of organic food produces a strong decrease in prosocial behavior and a strong up-tick in being morally judgmental (10.1177/1948550612447114). This is a potentially fascinating phenomenon–something like ‘moral licensing’, the ironic effect of good behavior fostering subsequent bad behavior. The original paper caught fire and the media covered these findings extensively. Rush Limbaugh even crowed about them as evidence of liberal hypocrisy. I noticed the media coverage, and this is how the original study made it onto my ‘possible replication’ list. Eileen found it there, read the paper, and developed a fantastic honors project to put the initial study to the test. For her project, Eileen contacted the original author to obtain the original materials. She planned and executed a large pre-registered replication attempt. She included a positive control (Retrospective Gambler’s task) so that if the main study ‘failed’ we would have a way to check if it was somehow her fault. She also devised a nice memory manipulation check to be sure that participants were attending to the study materials. She conducted the study and found little to no impact of organic food exposure on moral reasoning and little to no impact on prosocial behavior. She did find the expected outcome on the positive control, though–so sorry, doubters, this was not an example of researcher incompetence. Anyways, based on this philsophy, Eileen didn’t stop with 1 study. She conducted another larger study using Mechanical Turk. There are lots of legitimate concerns about MTurk, so we used the quality controls developed in Meg Cusack’s project (10.1371/journal.pone.0140806 )–screening out participants who don’t speak English natively, who take way too long or too short of a time to complete the study, etc. Despite all this care (and another successful positive control), Eileen still found that organic food produced about 0 change in moral judgments and prosocial behavior. Still not finished, Eileen obtained permission to conduct her study at an organic food market in Oak Park. Her and I spent two very hot Saturday mornings measuring moral judgments in those arriving at or leaving from the market. We reasoned those leaving from had just bought organic food and should feel much more smug than those merely arriving or passing by. Yes, there are some problems of making this assumption–but again, it was the overall pattern across multiple studies we cared about. And the pattern was once again consistent but disappointing–only a very small difference in the expected direction. Although Eileen and I were ready to call it quits at this point, our reviewers did not agree. They asked for one additional study with a regular participant pool. Eileen had graduated already, but I rolled up my sleeves and got it done. Fourth time, though, was not the charm–again there was little to no effect of organic food exposure. With all that said and done, Eileen and I conducted a final meta-anlysis integrating our results. The journal would not actually allow us to report on the field study (too different!? ), but across the other three studies we found that organic food exposure has little to no effect on moral judgments (d = 0.06, 95% CI [0.14, 0.26],N=377) and prosocial behavior (d=0.03, 95% CI [?0.17, 0.23],N=377). So–what’s our major contribution to science? Well, I suppose we have now dispelled what in retrospect is a somewhat silly notion that organic food exposure could have a substantial impact on moral behavior. We are also contributing to the ongoing meta-science examining the reliability of our published research literature–it gives me no joy to say that this ongoing work is largely painting a relatively bleak picture. Finally, I hope that we have now gained enough experience with replication work to be (modestly) showing the way a bit. I hope the practices that are now becoming routine for my honors students (pre-registration, multiple studies, positive controls, careful quality controls, and synthesis through meta-analysis) will become routine in the rest of replication land. No, strike that–these are practices that should really be routine in psychology. Holding my breath. Oh – an one other important thing about this paper–it was published in the same journal that published the original study. I think that’s exactly as it should be (journals should have to eat their own dog food). Obviously, though, this is exceptionally rare. I think it was quite daring for the journal to have published this replication, and I hope the good behavior of its editors are a model for others and a sign that things really are changing for the better.